Recycling Container with 1 Opening 15 gal. The first step in any successful recycling program is high-quality recycling containers. These recycle containers from Witt Industries are a great way to get your school or business going green. 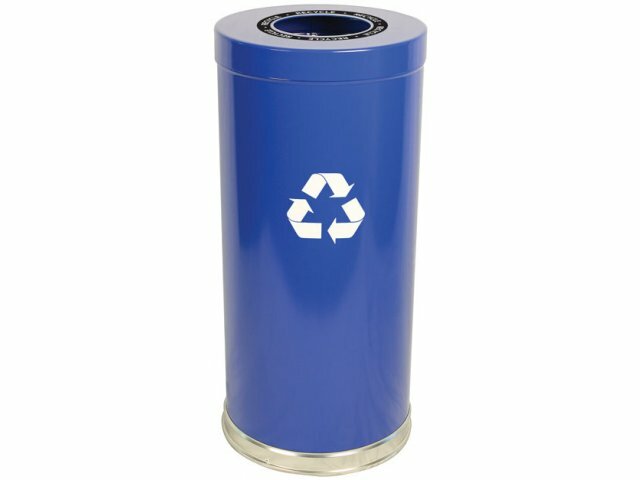 This attractive recycling container features a single opening that can accommodate a wide variety of recyclable materials, from bottles and cans to paper and compost. It's the perfect solution for single-stream recycling, waste or a combination of recyclable items. The lift-off top facilitates convenient servicing, and the rigid plastic liner allows for easy maintenance. Included, too, are durable recycling labels that let you designate each container so that your guests and patrons know just where to put which recyclable items. 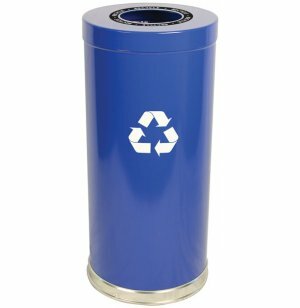 Available in a choice of colors to best match your décor, these high quality metal recycling containers provide schools and businesses with an aesthetic way to promote "green" awareness. Multi-Purpose: This single-opening recycling container lets you choose how you want to recycle: single-stream recycling, waste or a co-mingling of recyclable items. Versatile Opening: The size of the opening can accommodate a wide range of recyclables, from bottles to cans to compost. Low-Maintenance: Metal liner keeps the inside of the container clean, for a truly low-maintenance recycling container. Convenient Labeling: Durable recycling labels are included for fast labeling of containers for cans, bottles and cans, waste, recyclables and compost.